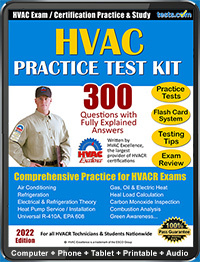 Find HVAC exam resources such as HVAC practice tests, HVAC study guides, courses, test tips and more. HVAC technicians are required to take an exam in certain states for licensure. Even if a state does not require a license to work in the field of HVACR, many technicians get certified through a professional organization. HVAC certification ensures prospective employers and customers that a technician is knowledgeable, trained and professional. With 150,000 and growing, HVAC Excellence is the largest provider of certifications in the HVACR industry. Highlights: Technician Certifications; Professional Level Certifications; Master Specialist Hands On Certifications; Employment Ready Certifications; Employment Ready Certifications; and Educator Certifications... Which type of certification is right for you? Description: Are you looking for HVAC training in Baltimore? Learn about the HVAC program available at Baltimore Career Training. There are several organizations that offer certification to HVACR technicians. These organizations require candidates to pass exams to earn certification. To become certified, a candidate typically has to have at least 1 year of installation experience and 2 years of maintenance and repair experience. No matter what exam you take, there are certain things which will help you be better prepared. To start with, you should create a study plan and follow it. Ideally you will start studying at least a couple months ahead of time. Even experienced HVACR technicians can fail a written exam so it is critical that you create and follow a plan. Your plan should begin months before the test and should continue to the day of the test. Most HVAC Excellence exams require a 70% score to pass. The results are reported with a percentage correct, as well as with a determination of pass/fail. Test-takers who take a computer-based test get their results immediately upon finishing the exam. Those who take a paper/pencil formatted test will receive their results in the mail five to seven business days after the exam. If one fails the exam, there are no restrictions on retaking the exam. With about 6 times more certifications awarded than any other certifying body, the rest of this review will focus on HVAC Excellence. An HVAC Excellence certification is an aid in identifying the scope and level of a technician's competency. Certifications available through HVAC Excellence include employment ready certifications, professional level certifications and master specialist certifications. Employment ready certifications are utilized by schools, utilities, apprenticeship programs, corporate trainers, contractors and wholesalers in their evaluation processes. For example, a training program or apprenticeship program may use an HVAC Excellence employment ready certification exam to determine if a student in its program has the knowledge necessary to graduate. They are also used by technicians to show employers that one has the skills necessary for employment or advancement. To earn an employment ready certification, a candidate must pass a written series of discipline specific exams. Professional level certifications are earned through taking and passing written exams where experienced technicians can demonstrate their knowledge. A technician must have two or more years of documented field experience to take a professional level certification exam. The candidate must also pass a Core exam with most specialty exams. The exams are given in both a paper and online format. The master specialist certification is the highest credential available through HVAC Excellence. To obtain the master level certification, a technician must demonstrate competency through a hands-on and written exam. To be eligible for participation in a Master Specialist exam, one must hold a Professional Level certification and have 3 years of field experience.